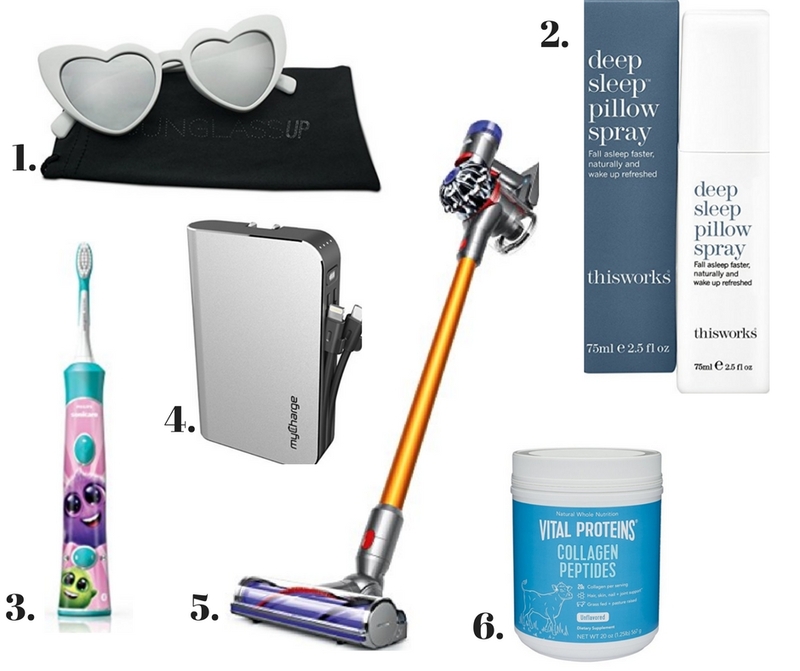 Shop these items and more of my Amazon favorites HERE. I am addicted to Amazon Prime. And guessing you probably are too. Recently, I set up an "Influencer Shop" there to corral, and share, my favorite purchases. * Every time I find something everyone should know about, I add it to the shop- so be sure to bookmark it or whatever your method of choice is so you can check back frequently. That said, these are 6 of the things in my little shop that I am most thrilled to currently own, and, at this risk of sounding repetitive, I am guessing you probably will be too. 1- Heart Sunglasses: Yes, you can spend hundreds on a designer pair. But, why would you? These are a fun, whimsical, one-season-if-that wear- and while I strongly suggest getting a truly protective pair of sunglasses to keep your eyes healthy (seriously, guys- don't mess around with that- you can learn more here), I am obsessed with these $11 frames for fun photo ops and such. I got matching ones for my daughters in a size better proportioned to their faces- which you can also find here. 2- ThisWorks Deep Sleep Pillow Spray: My friend Genny (yes, same one who turned me on this game changing skincare treatment) posted this on her Instagram ages ago. I saw it around 3am on a Wednesday- as I tossed and turned trying to sleep- and by Friday, it was in my possession. The scent is a combo of Lavender, Vetiver and Chamomile- and for whatever reason, it cues my mind into rest-mode and definitely helps me shut out the day. Maybe it is just the ritual of spritzing my pillow- but regardless, I am addicted. Plus, if you travel, bringing it along helps any hotel room feel that much more like home. 3- Phillips Sonicare Kids Toothbrush: My 7 year old actually gets EXCITED to brush her teeth since this entered our world. It connects to an app which I thought would be annoying- having to hand over my phone every time she has to brush her teeth- but it is SO worth it. The app makes brushing into a game- as she follows the animated movie, she kills googly-eyed germs, gets time cues for switching to a new part of the mouth, and at the end, gets to choose a "reward". Sonicare's quality is well-known- but the fact that they make a $40 toothbrush with that same amazing tech plus kid-friendly bells and whistles was total news to me. 4- MyCharge Portable Charger: This is the be-all end-all of portable chargers, bar none. It has everything built in: a foldable wall plug that goes right into any outlet and allows for pass-through charging so you can charge the powerbank and your devices simultaneously ; Apple iPhone Lightning and Micro-USB cables; and an extra USB port so you to charge 3 things at the same time, should you need. All the add-ons I usually forget when I run out the door are all attached- you literally can't screw it up. Once you have this, you will never be able to use any other travel charger again. Trust me. Oh- and it holds up to 6 complete battery charges when fully loaded, which is pretty awesome. 5- Dyson V8 Absolute Cordless Stick Vacuum Cleaner: If you have kids, you need this. My husband actually bought it- and I didn't use it for a month, instead, sticking to our tried and true handheld dust-buster thingie, because it felt less intimidating to me. Dumb move by me- this thing picks up EVERYTHING. The charge lasts 40 minutes, and it stores neatly. There is a V10 version which is like $200 more, and while it may be marginally better, I gotta say, this version is pretty damn incredible. 6- Vital Proteins Collagen Peptides: One of the most clicked-on items I have ever featured on my Facebook and Instagram, a scoop or two of this in my morning coffee has made the most dramatic difference in my hair and nails. I am the ultimate skeptic, but even jaded ol' me could not deny the obvious changes I was noticing in the mirror thanks to the high quality collagen peptides that somehow dissolve into this flavorless, odorless powder. What is the best thing you have bought on Amazon in the last 6 months? Please share in the comments- I am always on the hunt for new things to add to my wish list! *Yes, the Amazon Influencer shop is an affiliate program. I earn a small commission on sales- which is kinda cool- but even more than that, being the nerd at heart I am, the reason I am so damn excited about it is that I can peep the analytics and learn what things you guys are most interested in- what you click, what you buy, and when you do it. Affiliate programs (I am also part of RewardStyle, and recently joined the ShopStyle Collective as well) provide a lot of value for content creators of all sizes. For me, since my blog is on the smaller side (woe is me, right?! ), the monetary gains are teeny tiny- but the insights into my readers are perhaps the best- and most honest!- resource to help continually improve my content. If you have questions about these programs, feel free to leave a comment or message me, happy to answer anything and everything- it is such a fascinating space, IMHO. Mother's Day Gift Guide: One Word- Gucci.